Lakeview Cabin is a newly-renovated, four-season Vermont home perched above scenic and tranquil Lake Amherst in Plymouth, Vermont. The cabin is settled amongst private woods, pine forests and state parks. Lake Amherst is a peaceful lake that is perfect for kayaking, fishing and swimming in the summer and ice skating and ice fishing in the winter. Lakeview offers a private dock, large enough to sit, sunbathe and use as a tie-up for several canoes. The cabin's amenities also include a two-person kayak and four bikes for our guests' use. Lakeview boasts an excellent location for skiers and snowboarders looking for Vermont's premier ski resorts. The cabin is located less than 10 minutes from Okemo and 15 minutes from Killington (approx. 30 minutes to Bromley, Magic and Stratton). Summer hiking, biking, boating and outdoors activities abound. 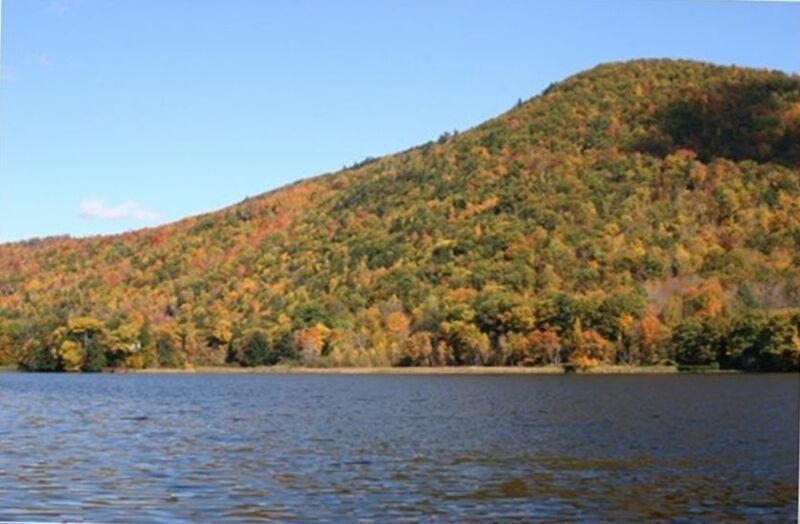 The New England fall foliage provides a breath-taking backdrop to the cabin's Lake Amherst views and winter snow sports are easily accessible and active from November through April, snowfall permitting. Family- and dog-friendly, Lakeview combines the quiet comfort and rustic charm of a Vermont lakeside cabin with the modern amenities that will make your stay easy and enjoyable. As a note to our guests - our private dock is located down the driveway and across VT Scenic Rt 100. Nice place with everything we needed! Beautiful lake view! So glad you had a wonderful stay! We hope you visit again soon. Great stay, close to ski! Cabin was as good as advertised, plenty of room for our family of five plus two dogs. Smack between Okemo and Killington we had a great stay. Owner was very responsive via email and over the top generous with a personal request. Vermont is beautiful, this lake view cabin let’s you really soak it in. So glad you had a wonderful stay. We hope you will return again to VT and Lakeview in the future! Dock on quiet lake, bunkroom for kids and wonderful firepit on hill with ample wood pile are highlights. Great communication and responsiveness from owners who answered questions immediately via text. Heat can be loud when running, but we needed it briefly off-season which may be the reason. Kitchenware (pots, pans, etc.) could be updated a bit. Renters should know busy road lies between house and lake but road noise is not a factor and crossing would only be a problem for very young kids. We would certainly return! So glad you had a wonderful trip! We hope you return in the future. Definitely not the place you want to stsy if you have small children, animals or an elderly person. Not for young children, pets or the elderly. Up on a steep incline, no beach access, you have to cross Route 100! While we are sorry to hear that you did not have a wonderful stay, we are very clear in our online description of the cabin and in our email correspondence to you that to access our private dock, you walk down the driveway and across VT Scenic Route 100. We respectfully disagree that it is not a great place for children, animals and the elderly - our daughter, nieces and nephews and dogs LOVE it and the cabin is all on one level. It seems as if this guest’s issue is less with our beautiful cabin (please see our other stellar online reviews) and more with their understanding or expectation of the property. Again, we are always sorry when a guest has any problems whatsoever and we do our best to be accessible and to address them in any way we can. We know we emailed with this guest approximately 5 times the day of their arrival. When they got to the cabin, their exact note to us was "THE CABIN IS GREAT, WITHOUT THE DOGS." At the time, they mentioned that they wanted a more secure yard for their two dogs to run free, but said nothing about concerns about the driveway and definitely not about the house. If you have any questions, please reach out to us. We are always happy to answer them. Thank you. The cabin was great! Close to the mountains and very nicely decorated. There is tons of room for sleeping arrangements, online pictures do not do it justice. Owners were very accomodating! Would definitely return. Thanks for the kind words. So glad you had a great trip...and that you were able to stay later on your last day to enjoy the amazing skiing! We hope you return soon.